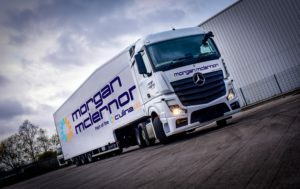 Cartwright has designed a new 4,650mm low height double deck temperature-controlled fridge trailer for major customer Culina Logistics without compromising Culina’s 1,830mm cage height requirement on each deck. Culina Logistics was distributing to a large supermarket customer in the Republic of Ireland which has a restricted access height of 4,650 mm in the Dublin Tunnel meaning that Culina’s 4,880mm high trailers could not enter. The new 4,650mm trailer enables Culina enter Ireland and the reduced height promises less damage caused by trees and low bridges and a reduction in trailer weight, increasing the payload. The new trailer also increases fuel economy up to 4 per cent. Culina expects to roll the new design out to its entire fleet across the U.K, describing it as a ‘game changer’.